The new Spier Secret Courtyard pop-up in the Cape Town city centre is seasoned with some of VISI’s favourite ingredients: design, wine, food and creative collaboration. You can even make friends for life! An official World Design Capital 2014 project, the Spier Secret Festival that happens annually in October decided it couldn’t wait that long to start the party. They launched a temporary bar slash restaurant slash creative project space in a dreamlike courtyard space they uncovered on Wale Street – where designer Liam Mooney’s shop used to be, alongside Honest Chocolate and Commune.1 Gallery. For the next three months, the space will host Secret Dinner nights on Thursdays, live music evenings on Fridays and outdoor movie showings on Saturday. A full range of Spier wine at cellar prices – including a very sneaky Chenin Blanc slushy – as well as Devil’s Peak ale and Dear Me snacks – such as buchu-and-chilli flavoured peanuts – are served. The Secret Dinner nights, as in previous years, promise to push the limits of experiential eating with people like Caro de Waal engineering a few Food Jams, Thingking and Soma (both of whom are featured as reasons to love SA design in our WDC2014 edition) teaming up to make an interactive chocolate factory, and even a jazz and curry, among other surprises. The cool kids from Yoh! are also collabing with Honest Chocolate for a movie night. The space itself is also testament to this spirit of like-minded passion, collaboration and experimentation. Inspired by the original geometric tile pattern of the courtyard and the massive old-school copper bar behind it, interior designer Hendrik Coetzee worked with the Kinsmen Collective and Renée Rossouw to incorporate geometric and copper elements throughout. 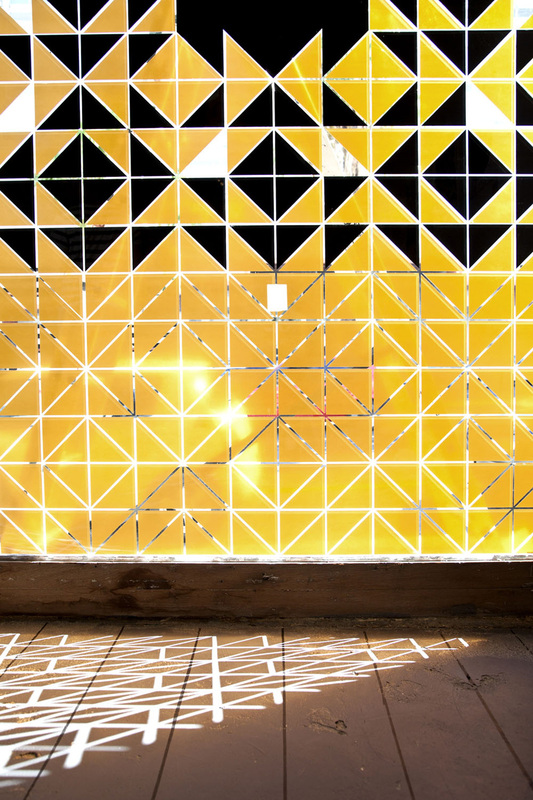 Architect and pattern-extraordinaire Renée’s “half-square” wall installation uses triangular tiles from Spier Architectural Arts stuck on a hand-drawn geometric grid to recall and play on the courtyard pattern. Primarily graphic designers, Kinsmen did the corporate identity including the logo, menus and copper-and-black tessellated vinyl window decal. Particularly fun are their perforated paper placemat-slash-doilies that guests can fold into all sorts of shapes and creations. Hendrik himself got resourceful with Spier wineboxes, which he painted copper inside and turned into pendant-style lamps. He also built tables for the courtyard from the boxes, and display units for the shop, which sells wine, cook books and other goodies. To go with the tables, Thingking made tripod stools that strap boxes as a seat onto copper-painted frames. Guests can even watch pictures from their phone dry on the wall! Bridging the physical and digital social divide, 250 Gram is printing guests’ Instagram pictures tagged with #spiersecret. The poloroid-style prints are then hung on the wall to be claimed when you leave – quite uncanny watching one’s phone come to life! Running for only three months in the build up to the Spier Secret Festival in October, Hannerie reassures that there are more exciting (secret for now) events on the cards. The festival itself will run over three days this year by incorporating the WDC2014 Food Indaba on the first day, which will have speakers focused on sustainability and food economy, followed by the more food design orientated speakers on the second day and the market on the third. Next Post Cape Town: (Un)safe for whom?